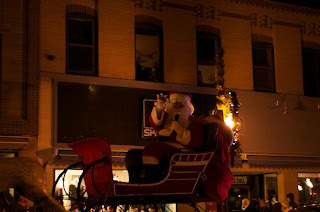 The Kawartha Komets received some additional public exposure on Saturday evening, December 4th as our float traveled down George Street during the 37th Annual Santa Claus Parade convened by The Kinsmen Club of Peterborough, one of the Komets' sponsors. I forgot to take my camera so we don't have any shots of our float. We had an excellent turnout of players and parents who braved the elements and rode down George Street. By the time Santa arrived we were all frozen. It's was fun though! The kids and old folks (like me) had a great time! Many thanks to the parents of our player Chris Tuck...Dave and Cathie Tuck...for decorating the float and making sure that everything was in place. You did a great job! Next on the schedule? Tuesday night, December 7th at the Liftlock Stars game at 7:00 p.m. at the Evinrude Centre. See you there!